The long, hot summer high temperatures are finally beginning to fade, and the perfect temperature is on its way. As the temperature begins to cool down, more and more of our residents are returning to SunBird. We are looking forward to having everyone back in SunBird. It has been a very busy summer here at SunBird with many improvement and maintenance projects already completed and others still in progress or scheduled. The ballroom has been closed for two weeks to perform annual routine maintenance work on the hardwood floor and will be completed by October 9. A small decorative divider wall is planned to be installed outside the clubhouse ballroom walkway between the outdoor barbeque covered patio area. The clubhouse sewer mechanical lift station, located below the clubhouse, is scheduled to be entirely replaced this month. During the lift station work, the fitness room will be closed for a few for annual maintenance and floor cleaning and treatment. After these projects, the clubhouse will be entirely powered washed, and all windows will be cleaned. The Horizon Room kitchen expansion and remodel project began early this summer on June 5 with a projected completion date of August 31. The project was completed, and the kitchen had its grand-opening tour right on time on August 31. The Horizon Room was packed with people excited to be part of the ribbon-cutting ceremony, with over 300 people touring that evening to look at the new kitchen. Of course, with any large grand opening, you can expect “Murphy’s Law” to take place. One of the air conditioners in the Horizon Room quit working during the grand opening, and the elevator started malfunctioning. Most likely, with the upper floor of the clubhouse having little use this summer and then having a very hot day and busy night of heavy use for the grand opening, some of the equipment was overworked. The elevator was reset and was able to operate for those who needed it that evening. The elevator contractor came later as a precaution to completely review, service and test the entire system. The air conditioner contractor also came that evening and found that the air compressor had quit working. The air conditioner has now been completely replaced with a brand-new unit within a couple days of quitting. SunBird seal coating and crack sealing roadwork has been completed for the year. SunBird Units 2, 3, 5, 6 and sections of 6A and 6B were scheduled for this year. This work was scheduled to take place over a two-week period of time, dividing areas into smaller sections of road to be closed for only 24 hours. The roadwork was completed as scheduled with no delay, although a couple of light rain storms moved around SunBird. We appreciate all the cooperation and understanding of the temporary road closures and detours. A concrete parking pad was installed east of the gatehouse on Augusta Avenue to provide parking for the SunBird Patrol staff and vehicles. This project turned out to be very beneficial in keeping this busy intersection less congested with patrol staff vehicles being parked off the roadway. The landscape was reconfigured in this area, also improving the look. The clubhouse had some surprises in August after about a three-inch rain and a heavy lightning storm. It was found that the clubhouse swimming pool main pump began stopping intermittently, the clubhouse roof drain on the west side of the building had a water leak and the Hunt Highway vehicle-control gate began malfunctioning. We believe that lightning may have struck close by SunBird, causing an electrical surge resulting in some of these electronic malfunctions. All have been serviced, repaired and are now operating as normal. 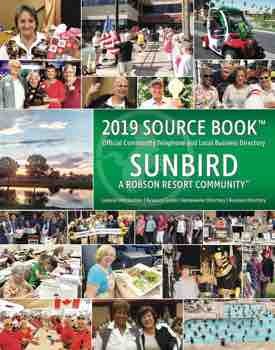 The 2018 SunBird draft operating budget has been in review with the Finance Committee and now the Board of Directors. The budget process began in April, early this year, with department heads meeting with the board and management to discuss services, challenges and/or future needs. After discussion, the board agreed on the direction we should continue, and a first-draft budget was developed based on expense history, inflation and other adjustments as necessary. The first-draft budget was submitted to the Finance Committee in August for review and comment. The Board of Directors has also been reviewing and discussing the proposed budget for 2018. After any revisions, it is anticipated to be approved at the October business meeting. Activities will be back in full throttle with Trivia, Karaoke, DJ Night, dances, Community Day and much more! We are looking forward to another fun-filled season and seeing everyone back at SunBird again!